Elida’s Drew Brockert leads off first base during Saturday’s game against Leipsic at Ed Sandy Field. See more game photos at LimaScores.com. 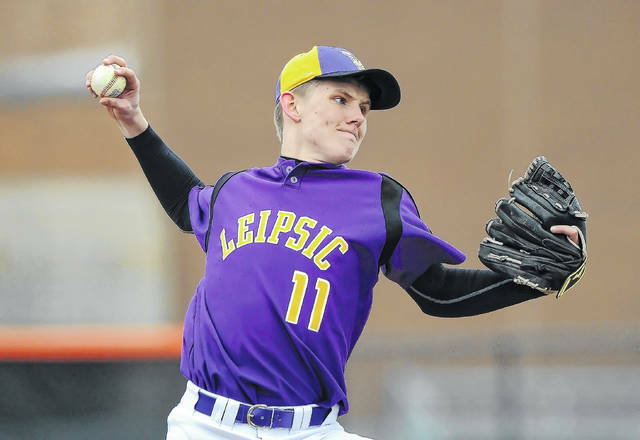 Leipsic’s Cole Rieman pitches against Elida during Saturday’s game at Ed Sandy Field. Elida’s Luke Burger pitches against Leipsic during Saturday’s game at Ed Sandy Field. 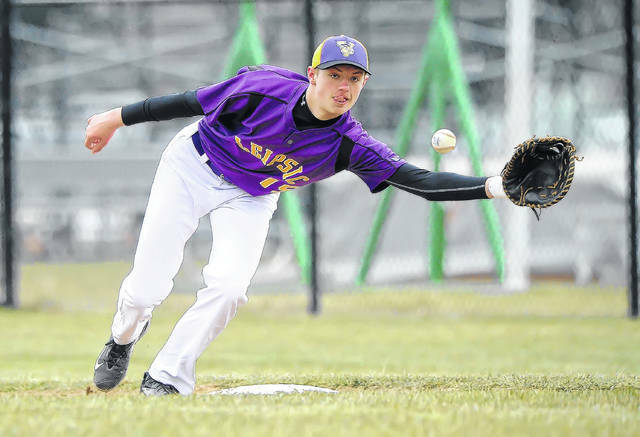 Leipsic’s Tyler Sickmiller reaches for a throw at first base during Saturday’s game at Ed Sandy Field. 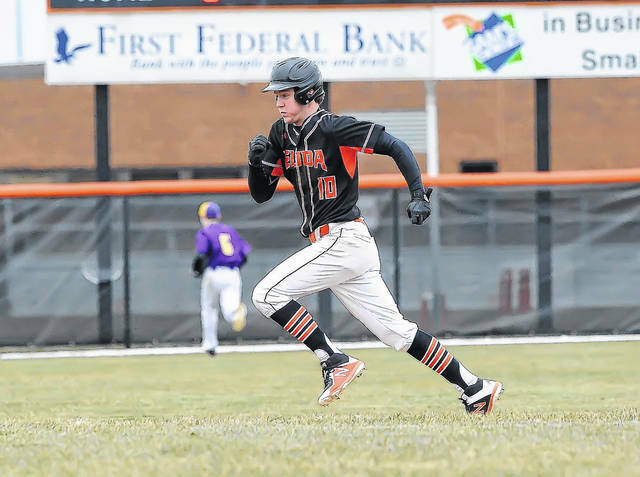 Elida’s Luke Burger runs the bases during Saturday’s game against Leipsic at Ed Sandy Field. 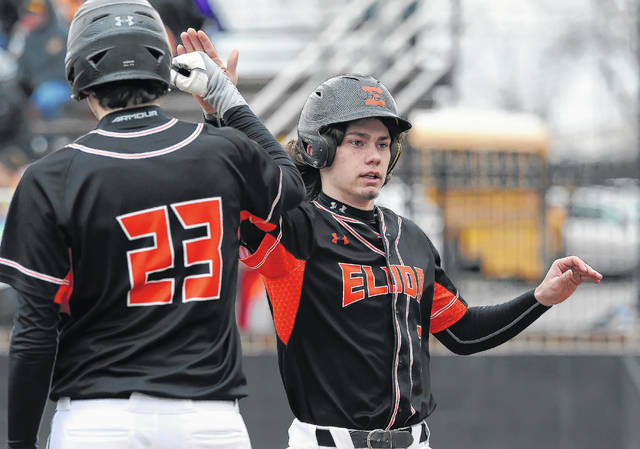 Elida’s Drew Biglow, right, is congratulated by teammate Justin Moore after scoring a run against Leipsic during Saturday’s game at Ed Sandy Field. ELIDA — Nearly everyone was huddled under a blanket and shivering. Then there was Elida’s Luke Burger. The sophomore Burger calmly took the mound and threw darts like it was the middle of June. 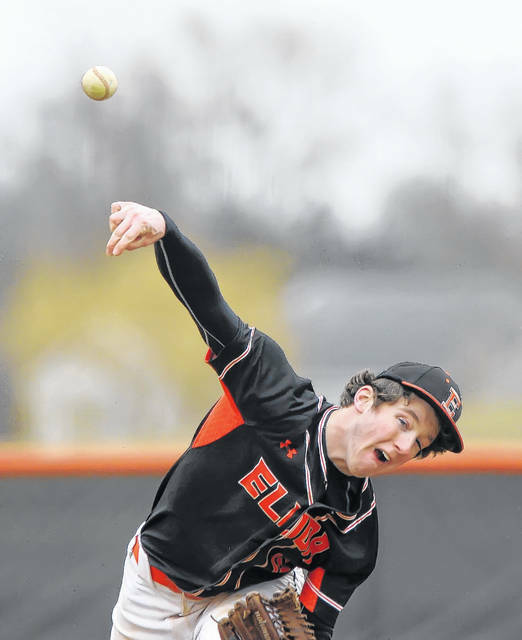 Burger fired a five-inning, no-hitter in Elida’s 10-0, run-rule win Saturday against Leipsic at Ed Sandy Field. Burger ended the game with a two-run, walk-off triple in the fifth inning. It was opening day for high school baseball in the state. In spite of 38-degree temperatures, with a 29-degree wind chill, Burger was locked in and dominate from the first inning on. The right-handed Burger struck out 13 and walked three in his no-hitter. He threw 87 pitches, 53 for strikes. Burger said his last no-hitter was back in Little League. The three walks were the only three runners he allowed to get on base. He struck out the side in the second, third and fourth innings. If that wasn’t enough, Burger went 2 for 3 at the plate, with a home run, triple and four RBI. Burger relied heavily on his 86-87 mph fastball, but he began getting strikeouts with his breaking ball in the fourth inning. Added Grapner, “We expected him to be good. In the offseason, we’ve seen how hard he’s worked. He pitched for the (Lima) Locos Express (in the summer). He’s a baseball kid and a hard worker. 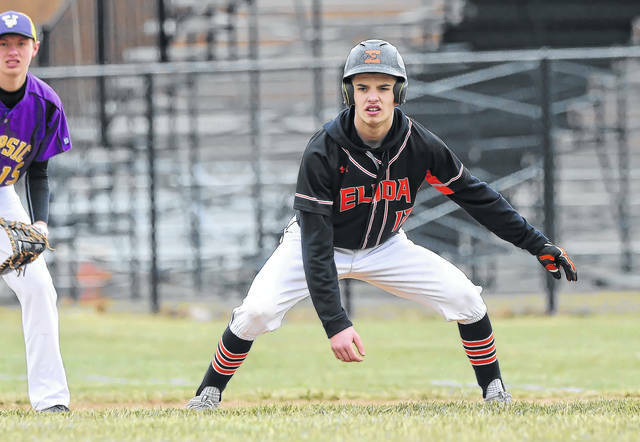 Also for Elida, Drew Biglow went 2 for 3 with a double. Shortstop Noah Adcock went 2 for 3. Adcock started the home first inning off with a single, then took second on a throwing error by the Leipsic shortstop. Adcock went to third on a passed ball and scored on a wild pitch to make it 1-0. Davis reached on a walk and came around to score on a wild pitch to give Elida a 2-0 lead in the first. Elida scored three in the second. Davis had an RBI single to make it 2-0. Burger then hit a rocket line drive to right, which tailed past the right fielder and rattled off the fence in right. He cleared the bases without a play at the plate for a two-run, inside-the-park homer. That gave Elida a 5-0 lead in the second. Biglow’s RBI double made it 6-0 in the third. Burger’s walk-off, two-run, two-out triple down the right-field line made it 10-0 and ended the game in the home fifth. Leipsic is without its top two pitchers, Dylan Schroeder (9-2 last year) and Tyler Hiegel, because of injuries. Vikings coach Darren Henry is hoping to have at least one back in April. Grapner said this was Elida’s first no-hitter in his seven seasons as coach. This entry was tagged Elida, leipsic. Bookmark the permalink.